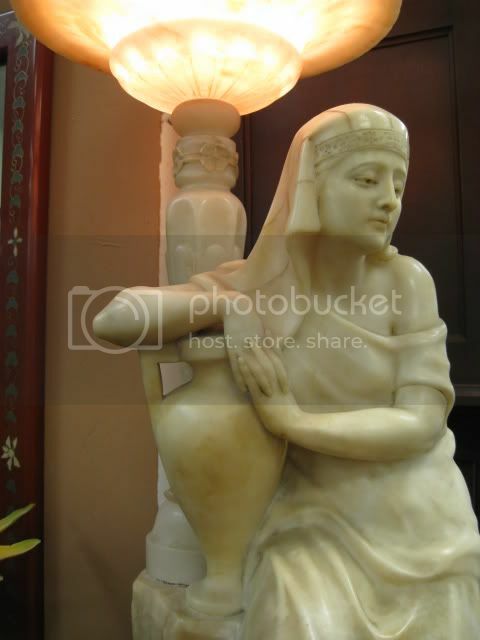 Antique lamps are some of the most beautiful and artistic antiques collected. Antique and vintage lamps come all styles, shapes, and sizes making them a perfect match for any design setting. We buy Antique Lamps! 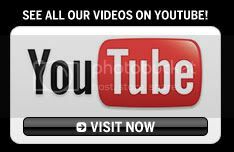 If you have vintage or antique lamps you would like to sell or have appraised Click here to Contact Us! 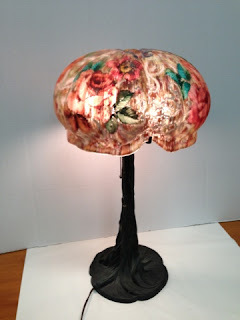 This antique lamp is beautiful! It was made by the Pairpoint company in the early 1900s. 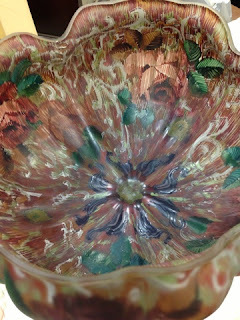 They were known for their gorgeous hand painted art glass lamp shades after they merged with Mount Washington Glassworks In the late 1800s, in New Bedford, Massachusetts. This particular one measures approximately 1 foot in diameter. It has four large lobes with smaller rounded lobes within each. The original and rare tree trunk form base is stamped with the Pairpoint name and logo. It stands approximately 2 feet tall with the shade. This is a great size because it would fit really well in a living room, dining room or bedroom. This shade is expertly reverse painted with large flower heads and pretty leaves amidst overall decoration. It was definitely a luxury item for the rich at the time it was made. We have known and seen this lamp for years in a local home and have finally been able to acquire it! It is in very good condition with no cracks and no chips. 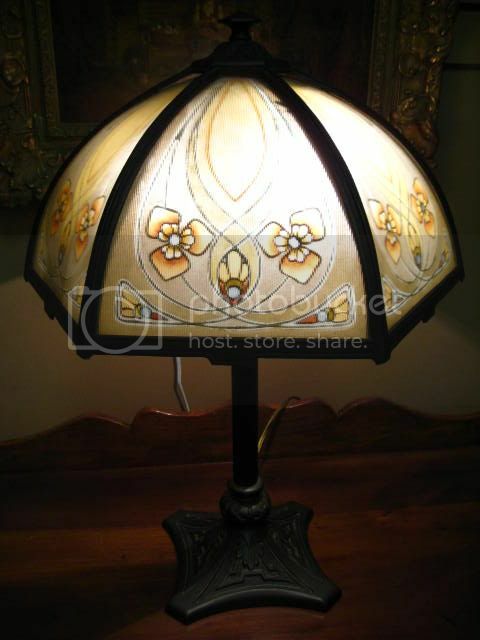 Pairpoint lamps were contemporary to Tiffany lamps with their distinction being the famous puffy shades. This antique lamp is heirloom quality! 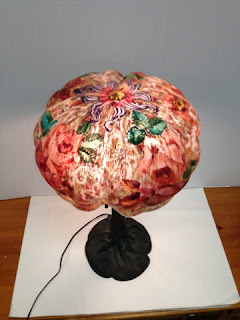 Click here to see our Antique lamp, Pairpoint Puffy Art Glass Lamp blog post. Antique lamp, Art Deco/Nouveau marble sculpture lamp just into our antiques mall here in Fort Myers, FL. 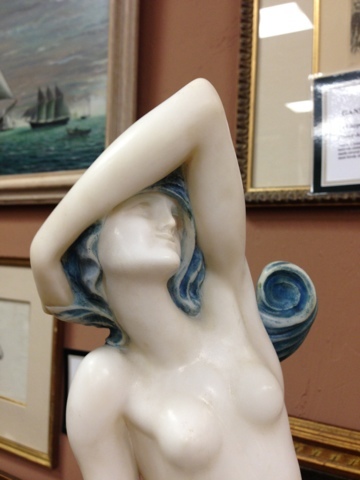 It is a fabulously carved antique marble sculpture from the early 1900s. I called her Venus because she reminds me of Botticelli's famous Birth of Venus 1486 painting where Venus is standing demurely on a shell with the wind blowing her hair. The artist did an expert rendition of the 1400s subject which he brought to his early 1900s era. It is pleasing both to Art Deco and Art Nouveau fans. In addition to being a stunning sculpture it's also an elegant antique lamp. The base lights up making this an even more beautiful piece perfect for any setting. Click here to see our Antique lamp, Art Deco/Nouveau marble sculpture lamp blog post. 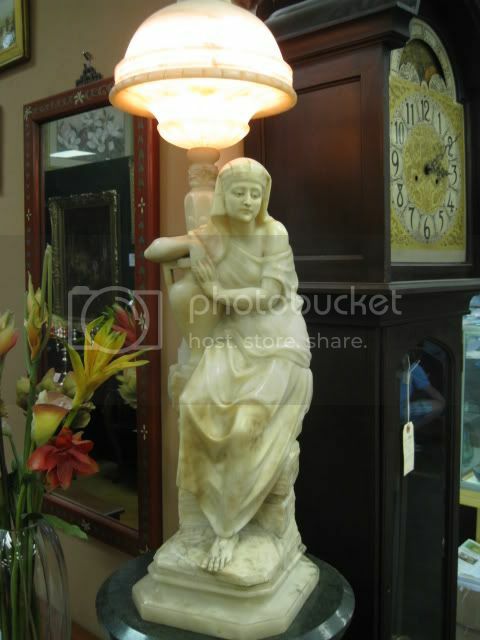 This is a very nice elegant marble and alabaster lamp from our antiques mall. It has a great look and stands almost 3' tall. 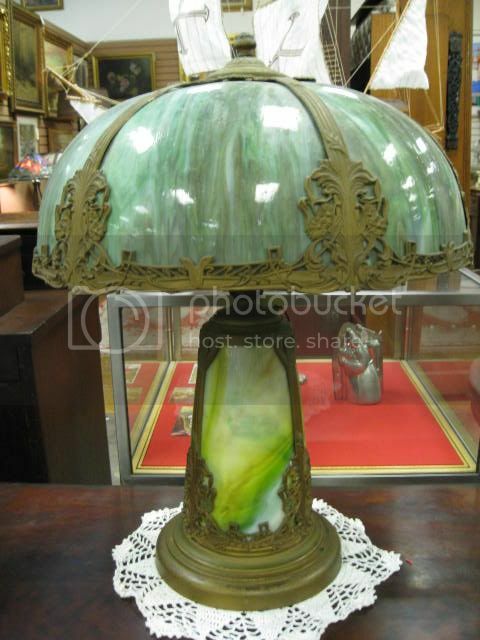 This is an amazing signed Tiffany Lamp that had just come into our antiques mall. It's a very large lamp, the shade has a diameter of 16". All the pieces are original and this lamp looks great. This lamp came in as part of a very well cared for collection and is one of the many great pieces you will find displayed in our showroom. ANTIQUE HANDEL REVERSE PAINTED GLASS SHADE ON MAGNIFICENT BRONZE BASE. THE GLASS SHADE HAS A BEAUTIFUL PAINTING OF FLOWERS WITH RICH COLORS INSIDE THE GLASS SHADE. THE SHADE RESTS ON A VERY ELEGANT BRONZE BASE. AS YOU CAN SEE FROM OUR PICTURES THE SHADE AND THE BASE ARE SIGNED. THE SHADE IS SIGNED TWICE, ONCE IN THE METAL RIM AT THE TOP OF THE SHADE AND ONCE AGAIN AT THE BOTTOM OF THE SHADE. THIS IS A WORKING LAMP AND IN GOOD CONDITION. THERE ARE NO BREAKS, REPAIRS, OR ISSUES IN THE SHADE. THIS LAMP STANDS ABOUT 20" TALL AND LOOKS ABSOLUTELY STUNNING. This is a rare lampograph from Burns and Pollok Electric Manufacturing Company. 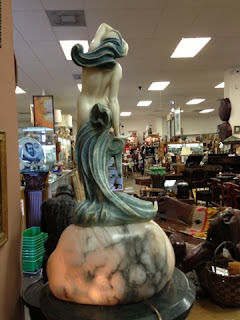 This is an amazing piece that has been well cared for through out the decades. The top has a great victorian style and the base is a horn. 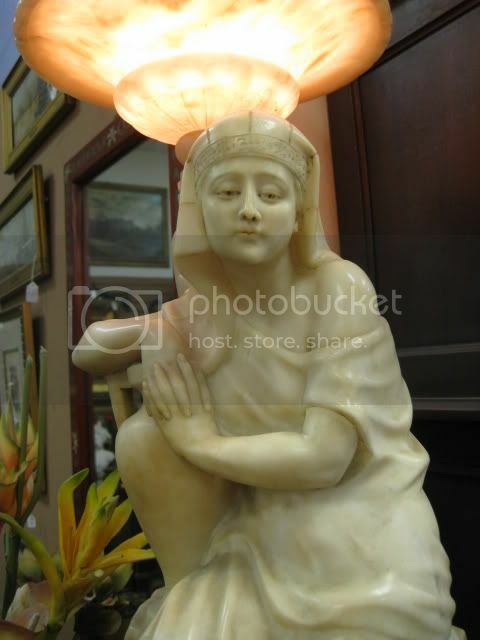 This is just one of the many vintage lamps you will find in our antiques mall. 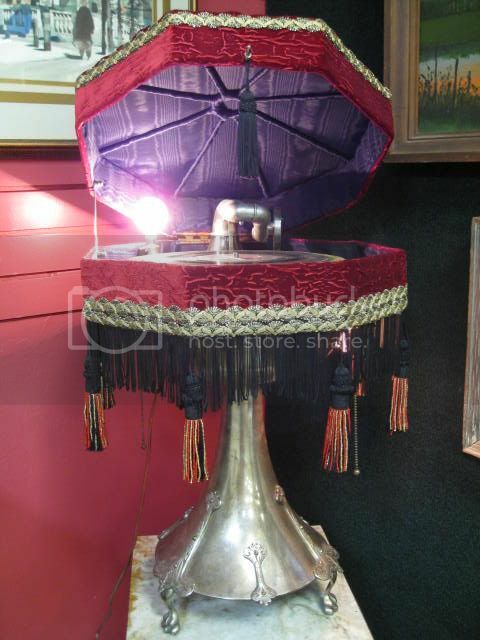 This is one of the great lamps we have in our showroom. 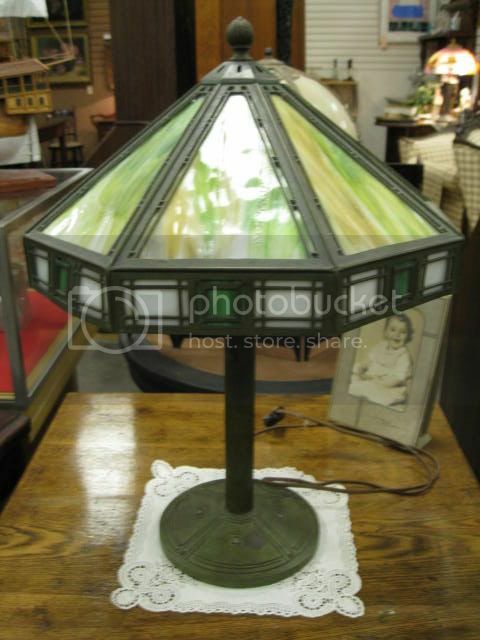 As you can se it has a beautiful slag glass shade with greens throughout. This vintage lamp also has a slg glass base which is more rare. 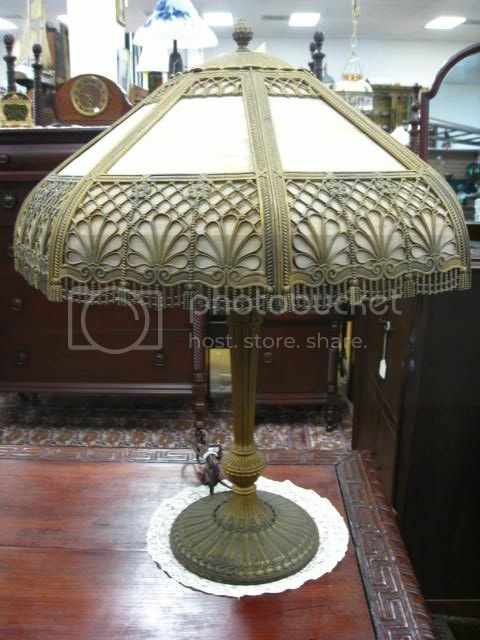 Come see all the great vintage lamps we have to offer in our antiques and art showroom at Gannon's Antiques & Art. 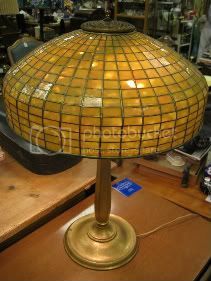 This is a great vintage slag glass lamp with metal base. As you can see it has a great slag glass shade and an elegant metal base. 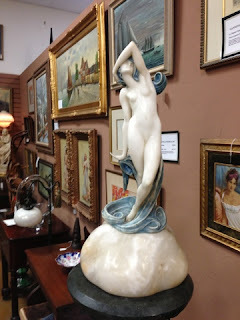 Come see all the great vintage lamps and antiques we have to offer in our antiques and art showroom at Gannon's Antiques & Art. 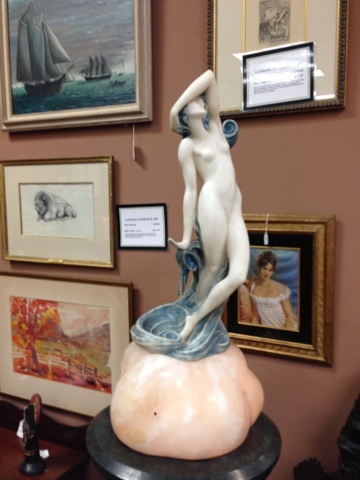 This is a very nice art nouveau lamp we have at Gannon's Antiques & Art. 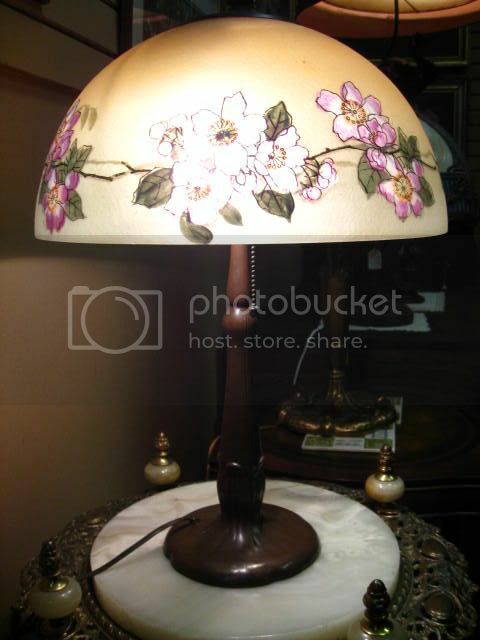 This has a beautiful reverse painted glass shade with nice soft colors. The shade rests on an elegant cast metal stand. This vintage lamp stands about 21.5" tall and looks terrific. 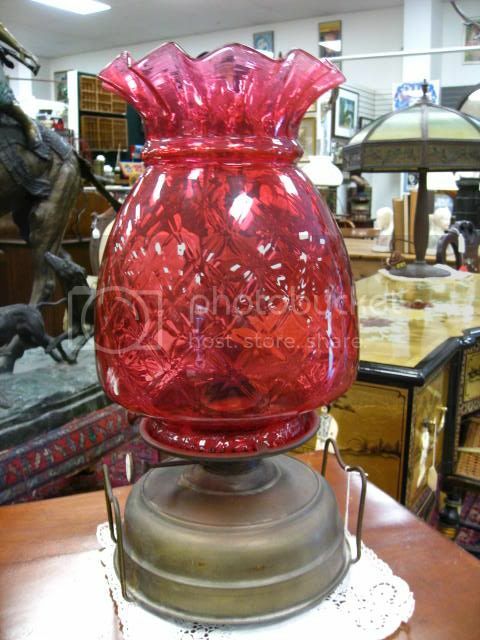 Antique oil lamp with large and beautiful cranberry quilted glass shade. This antique glass lamp measures about 19" tall and is a very rare find. This is just one of the many beautiful antique oil lamps we have in our showroom. Click here to go from Antique Lamps to our Online Store!